1 What is a bond; What is Government security? 2 Why should one invest in G-Secs? 3 How are the G-Secs issued? 4 What are the different types of auctions used for issue of securities? 5 What are Open Market Operations (OMOs)? 6 What is Liquidity Adjustment Facility (LAF) and whether Re-repo in Government Securities Market allowed? 7 How and in what form can G-Secs be held? 8 How does the trading in G-Secs take place? 9 Who are the major players in the G-Secs market? 10 What are the Do’s and Don’ts prescribed by RBI for the Co-operative banks dealing in G-Secs? 11 How are the dealing transactions recorded by the dealing desk? 12 What are the important considerations while undertaking security transactions? 13 Why does the price of G-Sec change? 14 How does one get information about the price of a G-Sec? 15 How are the G-Secs transactions reported? 16 How do the G-Secs transactions settle? 17 What is shut period? 18 What is Delivery versus Payment (DvP) settlement? 19 What is the role of the Clearing Corporation of India Limited (CCIL)? 20 What is the ‘When Issued’ market and “Short Sale”? 21 What are the basic mathematical concepts one should know for calculations involved in bond prices and yields? 22 How is the Price of a bond calculated? What is the total consideration amount of a trade and what is accrued interest? 23 What is the relationship between yield and price of a bond? 24 How is the yield of a bond calculated? 25 What are the day count conventions used in calculating bond yields? 26 How is the yield of a Treasury Bill calculated? 28 What are the important guidelines for valuation of securities? 29 What are the risks involved in holding G-Secs? What are the techniques for mitigating such risks? 30 What is money market? 31 What is the role of FIMMDA? 32 What are the various websites that give information on G-Secs? The contents of this primer are for general information and guidance purpose only. The Reserve Bank will not be liable for actions and/or decisions taken based on this Primer. Readers are advised to refer to the specific circulars issued by Reserve Bank of India from time to time. While every effort has been made to ensure that the information set out in this document is accurate, the Reserve Bank of India does not accept any liability for any action taken, or reliance placed on, any part, or all, of the information in this document or for any error in or omission from, this document. The G-Secs market has witnessed significant changes during the past decade. Introduction of an electronic screen based trading system, dematerialized holding, straight through processing, establishment of the Clearing Corporation of India Ltd. (CCIL) as the Central Counter Party (CCP) for guaranteed settlement, new instruments, and changes in the legal environment are some of the major aspects that have contributed to the rapid development of the G-Sec market. Major participants in the G-Secs market historically have been large institutional investors. With the various measures for development, the market has also witnessed the entry of smaller entities such as co-operative banks, small pension, provident and other funds etc. These entities are mandated to invest in G-Secs through respective regulations. However, some of these new entrants have often found it difficult to understand and appreciate various aspects of the G-Secs market. The Reserve Bank of India has, therefore, taken several initiatives to bring awareness about the G-Secs market among small investors. These include workshops on the basic concepts relating to fixed income securities/ bonds like G-Secs,, trading and investment practices, the related regulatory aspects and the guidelines. This primer is yet another initiative of the Reserve Bank to disseminate information relating to the G-Secs market to the smaller institutional players as well as the public. An effort has been made in this primer to present a comprehensive account of the market and the various processes and operational aspects related to investing in G-Secs in an easy-to-understand, question-answer format. The primer also has, as annexes, a list of primary dealers (PDs), useful excel functions and glossary of important market terminology. I hope the investors, particularly the smaller institutional investors will find the primer useful in taking decisions on investment in G-Secs. Reserve Bank of India would welcome suggestions in making this primer more user-friendly. 1.1 A bond is a debt instrument in which an investor loans money to an entity (typically corporate or government) which borrows the funds for a defined period of time at a variable or fixed interest rate. Bonds are used by companies, municipalities, states and sovereign governments to raise money to finance a variety of projects and activities. Owners of bonds are debt holders, or creditors, of the issuer. What is a Government Security (G-Sec)? 1.2 A Government Security (G-Sec) is a tradeable instrument issued by the Central Government or the State Governments. It acknowledges the Government’s debt obligation. Such securities are short term (usually called treasury bills, with original maturities of less than one year) or long term (usually called Government bonds or dated securities with original maturity of one year or more). In India, the Central Government issues both, treasury bills and bonds or dated securities while the State Governments issue only bonds or dated securities, which are called the State Development Loans (SDLs). G-Secs carry practically no risk of default and, hence, are called risk-free gilt-edged instruments. 1.3 Treasury bills or T-bills, which are money market instruments, are short term debt instruments issued by the Government of India and are presently issued in three tenors, namely, 91 day, 182 day and 364 day. Treasury bills are zero coupon securities and pay no interest. They are issued at a discount and redeemed at the face value at maturity. For example, a 91 day Treasury bill of ₹100/- (face value) may be issued at say ₹ 98.20, that is, at a discount of say, ₹1.80 and would be redeemed at the face value of ₹100/-. The return to the investors is the difference between the maturity value or the face value (that is ₹100) and the issue price (for calculation of yield on Treasury Bills please see answer to question no. 26). 1.5 Dated G-Secs are securities which carry a fixed or floating coupon (interest rate) which is paid on the face value, on half-yearly basis. Generally, the tenor of dated securities ranges from 5 years to 40 years. The Public Debt Office (PDO) of the Reserve Bank of India acts as the registry / depository of G-Secs and deals with the issue, interest payment and repayment of principal at maturity. Most of the dated securities are fixed coupon securities. In case, there are two securities with the same coupon and are maturing in the same year, then one of the securities will have the month attached as suffix in the nomenclature. eg. 6.05% GS 2019 FEB, would mean that G-Sec having coupon 6.05% that mature in February 2019 along with the other similar security having the same coupon. In this case, there is another paper viz. 6.05%GS2019 which bears same coupon rate and is also maturing in 2019 but in the month of June. Each security is assigned a unique number called ISIN (International Security Identification Number) at the time of issuance itself to avoid any misunderstanding among the traders. If the coupon payment date falls on a Sunday or any other holiday, the coupon payment is made on the next working day. However, if the maturity date falls on a Sunday or a holiday, the redemption proceeds are paid on the previous working day. Fixed Rate Bonds – These are bonds on which the coupon rate is fixed for the entire life (i.e. till maturity) of the bond. Most Government bonds in India are issued as fixed rate bonds. For example – 8.24%GS2018 was issued on April 22, 2008 for a tenor of 10 years maturing on April 22, 2018. Coupon on this security will be paid half-yearly at 4.12% (half yearly payment being half of the annual coupon of 8.24%) of the face value on October 22 and April 22 of each year. Zero Coupon Bonds – Zero coupon bonds are bonds with no coupon payments. However, like T- Bills, they are issued at a discount and redeemed at face value. The Government of India had issued such securities in the nineties, It has not issued zero coupon bonds after that. Capital Indexed Bonds – These are bonds, the principal of which is linked to an accepted index of inflation with a view to protecting the Principal amount of the investors from inflation. A 5 year capital indexed bond, was first issued in December 1997 which matured in 2002. Inflation Indexed Bonds (IIBs) - IIBs are bonds wherein both coupon flows and Principal amounts are protected against inflation. The inflation index used in IIBs may be Whole Sale Price Index (WPI) or Consumer Price Index (CPI). Globally, IIBs were first issued in 1981 in UK. In India, Government of India through RBI issued IIBs (linked to WPI) in June 2013. Since then, they were issued on monthly basis (on last Tuesday of each month) till December 2013. Based on the success of these IIBs, Government of India in consultation with RBI issued the IIBs (CPI based) exclusively for the retail customers in December 2013. Further details on IIBs are available on RBI website under FAQs. Bonds with Call/ Put Options – Bonds can also be issued with features of optionality wherein the issuer can have the option to buy-back (call option) or the investor can have the option to sell the bond (put option) to the issuer during the currency of the bond. It may be noted that such bond may have put only or call only or both options. The first G-Sec with both call and put option viz. 6.72%GS2012 was issued on July 18, 2002 for a maturity of 10 years maturing on July 18, 2012. The optionality on the bond could be exercised after completion of five years tenure from the date of issuance on any coupon date falling thereafter. The Government has the right to buy-back the bond (call option) at par value (equal to the face value) while the investor has the right to sell the bond (put option) to the Government at par value on any of the half-yearly coupon dates starting from July 18, 2007. Special Securities - Under the market borrowing programme, the Government of India also issues, from time to time, special securities to entities like Oil Marketing Companies, Fertilizer Companies, the Food Corporation of India, etc. (popularly called oil bonds, fertiliser bonds and food bonds respectively) as compensation to these companies in lieu of cash subsidies. These securities are usually long dated securities and carry marginally higher coupon (spread of about 20-25 bps) over the yield of the dated securities of comparable maturity. These securities are, however, not eligible SLR securities but are eligible as collateral for market repo transactions. The beneficiary entities may divest these securities in the secondary market to banks, insurance companies / Primary Dealers, etc., for raising funds. STRIPS – Separate Trading of Registered Interest and Principal of Securities.- STRIPS are the securities created by way of separating the cash flows associated with a regular G-Sec i.e. each semi-annual coupon payment and the final principal payment to be received from the issuer, into separate securities. They are essentially Zero Coupon Bonds (ZCBs). However, they are created out of existing securities only and unlike other securities, are not issued through auctions. Securities represent future cash flows (periodic interest and principal repayment) of an underlying coupon bearing bond. Being G-Secs, STRIPS are eligible for SLR. In India, currently dated securities (other than FRBs, IIBs and special securities) having their coupon due on Jan 2 and Jul 2 are eligible for STRIPPING. Guidelines for stripping and reconstitution of G-Secs have already been issued (IDMD circular dated March 25, 2010). For example, when ₹100 of the 8.24%GS2018 is stripped, each cash flow of coupon (₹ 4.12 each half year) will become a coupon STRIP and the principal payment (₹100 at maturity) will become a principal STRIP. These cash flows are traded separately as independent securities in the secondary market. STRIPS in G-Secs ensure availability of sovereign zero coupon bonds, which facilitate the development of a market determined zero coupon yield curve (ZCYC). STRIPS also provide institutional investors with an additional instrument for their asset liability management (ALM). Further, as STRIPS have zero reinvestment risk, being zero coupon bonds, they can be attractive to retail/non-institutional investors. The process of stripping/ reconstitution of G-Secs is carried out at RBI, Public Debt Office (PDO) in the CBS package of RBI i.e. E-Kuber through any of the Primary Dealer at the option of the holder at any time from the date of issuance of a G-Sec till its maturity. Physical securities are not eligible for stripping/reconstitution. Minimum amount of securities that needs to be submitted for stripping/reconstitution is ₹ 1 crore (Face Value) and in multiples thereof. They are currently tradable in both OTC market and on NDS-OM. Sovereign Gold Bond (SGB) : SGBs are unique instruments, prices of which are linked to commodity price viz Gold. SGBs are denominated in multiples of gram(s) of gold with a basic unit of 1 gram. The tenor of the SGB is for a period of 8 years with exit option from 5th year to be exercised on the interest payment dates. SGBs are restricted for sale to resident Indian entities including individuals, HUFs, trusts, Universities, charitable institutions. Price of bond at the time of issue is fixed in Indian Rupees on the basis of the previous week’s (Monday–Friday) simple average of closing price of gold of 999 purity published by the India Bullion and Jewellers Association Ltd. (IBJA). The redemption price will be in Indian Rupees based on previous week’s (Monday-Friday) simple average of closing price of gold of 999 purity published by IBJA. The investors are compensated at a fixed rate annum payable semi-annually on the initial value of investment. SGBs are eligible for SLR, can be used as collateral for loans and are tradeable on stock exchanges. 1.7 State Governments also raise loans from the market which are called SDLs. SDLs are dated securities issued through normal auction similar to the auctions conducted for dated securities issued by the Central Government (please see question 3). Interest is serviced at half-yearly intervals and the principal is repaid on the maturity date. Like dated securities issued by the Central Government, SDLs issued by the State Governments also qualify for SLR. They are also eligible as collaterals for borrowing through market repo as well as borrowing by eligible entities from the RBI under the Liquidity Adjustment Facility (LAF). State Governments have also issued special securities under “Ujjwal Discom Assurance Yojna (UDAY) Scheme for Operational and Financial Turnaround of Power Distribution Companies (DISCOMs)” notified by Ministry of Power vide Office Memorandum (No 06/02/2015-NEF/FRP) dated November 20, 2015. 2. Why should one invest in G-Secs? Besides providing a return in the form of coupons (interest), G-Secs offer the maximum safety as they carry the Sovereign’s commitment for payment of interest and repayment of principal. G-Secs are available in a wide range of maturities from 91 days to as long as 40 years to suit the duration of varied liability structure of various institutions. G-Secs can be sold easily in the secondary market to meet cash requirements. G-Secs can also be used as collateral to borrow funds in the repo market. Securities such as State Development Loans (SDLs) and Special Securities (Oil bonds, UDAY bonds etc) provide attractive yields. The settlement system for trading in G-Secs, which is based on Delivery versus Payment (DvP), is a very simple, safe and efficient system of settlement. The DvP mechanism ensures transfer of securities by the seller of securities simultaneously with transfer of funds from the buyer of the securities, thereby mitigating the settlement risk. G-Sec prices are readily available due to a liquid and active secondary market and a transparent price dissemination mechanism. 2.2 Section 24 (2A) of the Banking Regulation Act 1949, (as applicable to co-operative societies) provides that every primary (urban) cooperative bank shall maintain liquid assets, the value of which shall not be less than such percentage as may be specified by Reserve Bank in the Official Gazette from time to time and not exceeding forty percentage of its DTL in India as on the last Friday of the second preceding fortnight (in addition to the minimum cash reserve ratio (CRR) requirement). Such liquid assets shall be in the form of cash, gold or unencumbered investment in approved securities. This is referred to as the Statutory Liquidity Ratio (SLR) requirement. It may be noted that balances kept with State Co-operative Banks / District Central Co-operative Banks as also term deposits with public sector banks are now not eligible for being reckoned for SLR purpose w.e.f April 1, 2015. 2.3 As per Section 24 of the Banking Regulation Act 1949, the State Co-operative Banks (SCBs) and the District Central Co-operative Banks (DCCBs) are required to maintain assets as part of the SLR requirement in cash, gold or unencumbered investment in approved securities the value of which shall not, at the close of business on any day, be less than such per cent, as prescribed by RBI, of its total net demand and time liabilities . DCCBs are allowed to meet their SLR requirement by maintaining cash balances with their respective State Co-operative Bank. 2.4 Since April 2002, all the RRBs are required to maintain their entire Statutory Liquidity Ratio (SLR) holdings in Government and other approved securities. 2.5 The non- Government provident funds, superannuation funds and gratuity funds are required by the Central Government, effective from January 24, 2005, to invest 40% of their incremental accretions in Central and State G-Secs, and/or units of gilt funds regulated by the Securities and Exchange Board of India (SEBI) and any other negotiable security fully and unconditionally guaranteed by the Central/State Governments. The exposure of a trust to any individual gilt fund, however, should not exceed five per cent of its total portfolio at any point of time. The investment guidelines for non- Government PFs have been recently revised in terms of which minimum 45% and up to 50% of investments are permitted in a basket of instruments consisting of (a) G-Secs, (b) Other securities (not in excess of 10% of total portfolio) the principal whereof and interest whereon is fully and unconditionally guaranteed by the Central Government or any State Government SDLs and (c) units of mutual funds set up as dedicated funds for investment in G-Secs (not more than 5% of the total portfolio at any point of time and fresh investments made in them shall not exceed 5% of the fresh accretions in the year), effective from April 2015. 3. How are the G-Secs issued? 3.1 G-Secs are issued through auctions conducted by RBI. Auctions are conducted on the electronic platform called the E-Kuber, the Core Banking Solution (CBS) platform of RBI. Commercial banks, scheduled UCBs, Primary Dealers (a list of Primary Dealers with their contact details is given in Annex 2), insurance companies and provident funds, who maintain funds account (current account) and securities accounts (Subsidiary General Ledger (SGL) account) with RBI, are members of this electronic platform. All members of E-Kuber can place their bids in the auction through this electronic platform. All non-E-Kuber members including non-scheduled UCBs can participate in the primary auction through scheduled commercial banks or PDs (called as Primary Members-PMs). For this purpose, the UCBs need to open a securities account with a bank / PD – such an account is called a Gilt Account. A Gilt Account is a dematerialized account maintained with a scheduled commercial bank or PD. The proprietary transactions in G-Secs undertaken by PMs are settled through SGL account maintained by them with RBI at PDO. The transactions in G-Secs undertaken by Gilt Account Holders (GAHs) through their PMs are settled through Constituent Subsidiary General Ledger (CSGL) account maintained by PMs with RBI at PDO for its constituent (e.g., a non-scheduled UCB). 3.2 The RBI, in consultation with the Government of India, issues an indicative half-yearly auction calendar which contains information about the amount of borrowing, the range of the tenor of securities and the period during which auctions will be held. A Notification and a Press Communique giving exact particulars of the securities, viz., name, amount, type of issue and procedure of auction are issued by the Government of India about a week prior to the actual date of auction. RBI places the notification and a Press Release on its website (www.rbi.org.in) and also issues advertisements in leading English and Hindi newspapers. Information about auctions is also available with select branches of public and private sector banks and the PDs. Auction for dated securities is conducted on Friday for settlement on T+1 basis (i.e. securities are issued on next working day i.e. Monday). The investors are thus given adequate time to plan for the purchase of G-Secs through such auctions. A specimen of a dated security in physical form is given at Annex 1. The details of all the dated securities issued by the Government of India are available on the RBI website at http://www.rbi.org.in/Scripts/financialmarketswatch.aspx. A sample of the auction calendar and the auction notification are given in Annex 3 and 4 respectively. 3.3 The Reserve Bank of India conducts auctions usually every Wednesday to issue T-bills. Settlement for the T-bills auctioned is made on T+1 day i.e. on the working day following the trade day. The 91 day T-bills are auctioned on every Wednesday. The Treasury bills of 182 days and 364 days tenure are auctioned on alternate Wednesdays. T-bills of 364 days tenure are auctioned on the Wednesday preceding the reporting Friday while 182 T-bills are auctioned on the Wednesday prior to a non-reporting Friday. The Reserve Bank releases a quarterly calendar of T-bill issuances for the upcoming quarter in the last week of the preceding quarter. e.g. calendar for April-June period is notified in the last week of March. The Reserve Bank of India announces the issue details of T-bills through a press release on its website every week. 3.4 Like T-bills, Cash Management Bills (CMBs) are also issued at a discount and redeemed at face value on maturity. The tenor, notified amount and date of issue of the CMBs depend upon the temporary cash requirement of the Government. The tenors of CMBs is generally less than 91 days. The announcement of their auction is made by Reserve Bank of India through a Press Release on its website. The settlement of the auction is on T+1 basis. The non-competitive bidding scheme (referred to in paragraph number 4.3 and 4.4 under question No. 4) has not been extended to the CMBs. However, these instruments are tradable and qualify for ready forward facility. Investment in CMBs is also reckoned as an eligible investment in G-Secs by banks for SLR purpose under Section 24 of the Banking Regulation Act, 1949. First set of CMBs were issued on May 12, 2010. In terms of Sec. 21A (1) (b) of the Reserve Bank of India Act, 1934, the RBI may, by agreement with any State Government undertake the management of the public debt of that State. Accordingly, the RBI has entered into agreements with 29 State Governments and one Union Territory (UT of Puducherry) for management of their public debt. Under Article 293(3) of the Constitution of India (Under section 48A of Union territories Act, in case of Union Territory), a State Government has to obtain the permission of the Central Government for any borrowing as long as there is any outstanding loan that the State Government may have from the Centre. Market borrowings are raised by the RBI on behalf of the State Governments to the extent of the allocations under the Market Borrowing Programme as approved by the Ministry of Finance in consultation with the Planning Commission. RBI, in consultation with State Governments announces, the indicative quantum of borrowing on a quarterly basis. All State Governments have issued General notifications which specify the terms and conditions for issue of State Government securities. Before every auction, respective state governments issue specific notifications indicating details of the securities being issued in the particular auction. RBI places a press release on its website and also issues advertisements in leading English and vernacular newspapers of the respective states. Currently, SDL auctions are held on second and fourth Tuesdays every month. As in case of Central G-Secs, auction is held on the E-Kuber Platform. Here 10% of the notified amount is reserved for the retail investors under the non-competitive bidding. 4. What are the different types of auctions used for issue of securities? Prior to introduction of auctions as the method of issuance, the interest rates were administratively fixed by the Government. With the introduction of auctions, the rate of interest (coupon rate) gets fixed through a market based price discovery process. 4.1 An auction may either be yield based or price based. * January 9 and 10 being holidays (Saturday and Sunday), settlement is done on January 11, 2016 (T+1 settlement). The issuer would get the notified amount by accepting bids up to bid at sl. no. 5. Since the bid number 6 also is at the same yield, bid numbers 5 and 6 would get allotment on pro-rata basis so that the notified amount is not exceeded. In the above case each of bidder at sl. no. 5 and 6 would get ₹ 50 crore. Bid numbers 7 and 8 are rejected as the yields are higher than the cut-off yield. *Price corresponding to the yield is determined as per the relationship given under YTM calculation in question 24. * January 9 and 10being holidays (Saturday and Sunday), settlement is done on January 11, 2016 under T+1 cycle. The issuer would get the notified amount by accepting bids up to 5. Since the bid number 6 also is at the same price, bid numbers 5 and 6 would get allotment in proportion so that the notified amount is not exceeded. In the above case each of bidders at sl. no. 5 and 6 would get securities worth ₹ 50 crore. Bid numbers 7 and 8 are rejected as the price quoted is less than the cut-off price. 4.2 Depending upon the method of allocation to successful bidders, auction may be conducted on Uniform Price basis or Multiple Price basis. In a Uniform Price auction, all the successful bidders are required to pay for the allotted quantity of securities at the same rate, i.e., at the auction cut-off rate, irrespective of the rate quoted by them. On the other hand, in a Multiple Price auction, the successful bidders are required to pay for the allotted quantity of securities at the respective price / yield at which they have bid. In the example under (ii) above, if the auction was Uniform Price based, all bidders would get allotment at the cut-off price, i.e., ₹100.20. On the other hand, if the auction was Multiple Price based, each bidder would get the allotment at the price he/ she has bid, i.e., bidder 1 at ₹100.31, bidder 2 at ₹100.26 and so on. i. Competitive Bidding: In a competitive bidding, an investor bids at a specific price / yield and is allotted securities if the price / yield quoted is within the cut-off price / yield. Competitive bids are made by well informed institutional investors such as banks, financial institutions, PDs, mutual funds, and insurance companies. The minimum bid amount is ₹10,000 and in multiples of ₹10,000 in dated securities and minimum ₹ 25,000 in case of T-Bills and in multiples of ₹ 25,000 thereafter. Multiple bidding is also allowed, i.e., an investor may put in multiple bids at various prices/ yield levels. ii. Non-Competitive Bidding (NCB): With a view to providing retail investors, who may lack skill and knowledge about G-Sec market or who have low demand and to enable them to participate in the auction directly, the scheme of NCB in dated securities was introduced in January 2002. NCB is open to individuals, HUFs, RRBs, co-operative banks, firms, companies, corporate bodies, institutions, provident funds, and trusts. Under the scheme, eligible investors apply for a certain amount of securities in an auction without mentioning price/yield. Such bidders are allotted securities at the weighted average price/yield of the auction. In the illustration given under 4.1 (ii) above, the notified amount being ₹1000 crore, the amount reserved for NCB will be ₹ 50 crore (5% of the notified amount). Non-competitive bidders will be allotted at the weighted average price which is ₹100.26 in the given illustration. The participants in NCB are, however, required to hold a gilt account with a bank or PD. RRBs and co-operative banks which hold SGL and Current Account with the RBI can also participate under the scheme of NCB without holding a gilt account. The amount reserved for NCB is 5% of the notified amount in case of GoI dated securities auctions,10% of the notified amount in case of SDL auctions and 20% of the notified amount in case of auction of Inflation Indexed Bonds (IIBs). Banks/PDs are required to consolidate the individual requirements of their clients and allowed to submit only a single bid under NCB. 4.4 In every auction of GoI dated securities, a maximum of 5% of the notified amount is reserved for such non-competitive bids. In the case of auction for Treasury Bills, the amount accepted for non-competitive bids is over and above the notified amount and there is no limit placed. However, NCB in Treasury Bills is available only to State Governments, eligible Provident Funds, select foreign central banks and is not available to the co-operative banks for proprietary bids. Only one bid is allowed to be submitted by an investor either through a bank or PD. For bidding under the scheme, an investor has to fill in an undertaking and send it along with the application for allotment of securities through a bank or a PD. The minimum amount and the maximum amount for a single bid is ₹10,000 and ₹2 crore respectively in the case of an auction of dated securities. A bank or a Primary Dealer can charge an investor up to a maximum of 6 paise per ₹100 of application money as commission for rendering their services. In case, the total applications received for non-competitive bids exceed the ceiling of 5 per cent of the notified amount of the auction for dated securities, the bidders are allotted securities on a pro-rata basis. 4.5 NCB scheme has been introduced in SDLs from August 2009. The aggregate amount reserved for the purpose in the case of SDLs is 10% of the notified amount (eg. ₹100 Crore for a notified amount of ₹1000 Crore) subject to a maximum limit of 1% of notified amount for a single bid per stock. The bidding and allotment procedure is similar to that of G-Secs. 5. What are Open Market Operations (OMOs)? OMOs are the market operations conducted by the RBI by way of sale/ purchase of G-Secs to/ from the market with an objective to adjust the rupee liquidity conditions in the market on a durable basis. When the RBI feels that there is excess liquidity in the market, it resorts to sale of securities thereby sucking out the rupee liquidity. Similarly, when the liquidity conditions are tight, RBI may buy securities from the market, thereby releasing liquidity into the market. 5 (b) What is meant by repurchase (buyback) of G-Secs? Repurchase (buyback) of G-Secs is a process whereby the Government of India and State Governments buy back their existing securities, by redeeming them prematurely, from the holders. The objectives of buyback can be reduction of cost (by buying back high coupon securities), reduction in the number of outstanding securities and improving liquidity in the G-Secs market (by buying back illiquid securities)and infusion of liquidity in the system. The repurchase by the Government of India is also undertaken for effective cash management by utilising the surplus cash balances. For e.g. Repurchase of two securities (7.59%2016 worth ₹ 9351.563 cr and 7.02%2016 worth ₹ 6177.419 cr) was done through reverse auction on February 22, 2016. State Governments generally buy-back their high coupon (high cost debt) bearing securities to reduce their interest outflows in the times when interest rates show a falling trend. States also retire their high cost debt pre-maturely in order to fulfill some of the conditions put by international lenders like Asian Development Bank, World Bank etc. to grant them low cost loans. Governments make provisions in their budget for buying back of existing securities. Buyback can be done through an auction process (generally if amount is large) or through the secondary market route, i.e. NDS-OM (if amount is not large). 6. What is Liquidity Adjustment Facility (LAF) and whether Re-repo in Government Securities Market is allowed? LAF is a facility extended by RBI to the scheduled commercial banks (excluding RRBs) and PDs to avail of liquidity in case of requirement or park excess funds with RBI in case of excess liquidity on an overnight basis against the collateral of G-Secs including SDLs. Basically, LAF enables liquidity management on a day to day basis. The operations of LAF are conducted by way of repurchase agreements (repos and reverse repos – please refer to paragraph numbers 30.4 to 30.8 under question no. 30 for more details) with RBI being the counter-party to all the transactions. The interest rate in LAF is fixed by RBI from time to time. LAF is an important tool of monetary policy and liquidity management. Scheduled commercial banks, Primary Dealers along with Mutual Funds and Insurance Companies (subject to the approval of the regulators concerned) maintaining Subsidiary General Ledger account with RBI are permitted to re-repo the government securities, including SDLs and Treasury Bills, acquired under reverse repo, subject to various conditions and guidelines prescribed by RBI time to time. 7. How and in what form can G-Secs be held? 7.1 The Public Debt Office (PDO) of RBI, acts as the registry and central depository for G-Secs. They may be held by investors either as physical stock or in dematerialized (demat/electronic) form. From May 20, 2002, it is mandatory for all the RBI regulated entities to hold and transact in G-Secs only in dematerialized (SGL) form. a. Physical form: G-Secs may be held in the form of stock certificates. A stock certificate is registered in the books of PDO. Ownership in stock certificates can not be transferred by way of endorsement and delivery. They are transferred by executing a transfer form as the ownership and transfer details are recorded in the books of PDO. The transfer of a stock certificate is final and valid only when the same is registered in the books of PDO. SGL Account: Reserve Bank of India offers SGL Account facility to select entities who can hold their securities in SGL accounts maintained with the Public Debt Offices of the RBI. Only financially strong entities viz. Banks, PDs, select UCBs and NBFCs which meet RBI guidelines (please see RBI circular IDMD.DOD.No.13/10.25.66/2011-12 dt Nov 18, 2011) are allowed to maintain SGL with RBI. Gilt Account: As the eligibility to open and maintain an SGL account with the RBI is restricted, an investor has the option of opening a Gilt Account with a bank or a PD which is eligible to open a CSGL account with the RBI. Under this arrangement, the bank or the PD, as a custodian of the Gilt Account holders, would maintain the holdings of its constituents in a CSGL account (which is also known as SGL II account) with the RBI. The servicing of securities held in the Gilt Accounts is done electronically, facilitating hassle free trading and maintenance of the securities. Receipt of maturity proceeds and periodic interest is also faster as the proceeds are credited to the current account of the custodian bank / PD with the RBI and the custodian (CSGL account holder) immediately passes on the credit to the Gilt Account Holders (GAH). 7.2 Investors also have the option of holding G-Secs in a dematerialized account with a depository (NSDL / CDSL, etc.). This facilitates trading of G-Secs on the stock exchanges. 8. How does the trading in G-Secs take place? 8.1 There is an active secondary market in G-Secs. The securities can be bought / sold in the secondary market either through (i) Negotiated Dealing System-Order Matching (NDS-OM) (anonymous online trading) or through (ii) Over the Counter (OTC) and reported on NDS-OM or (iii) NDS-OM-Web. 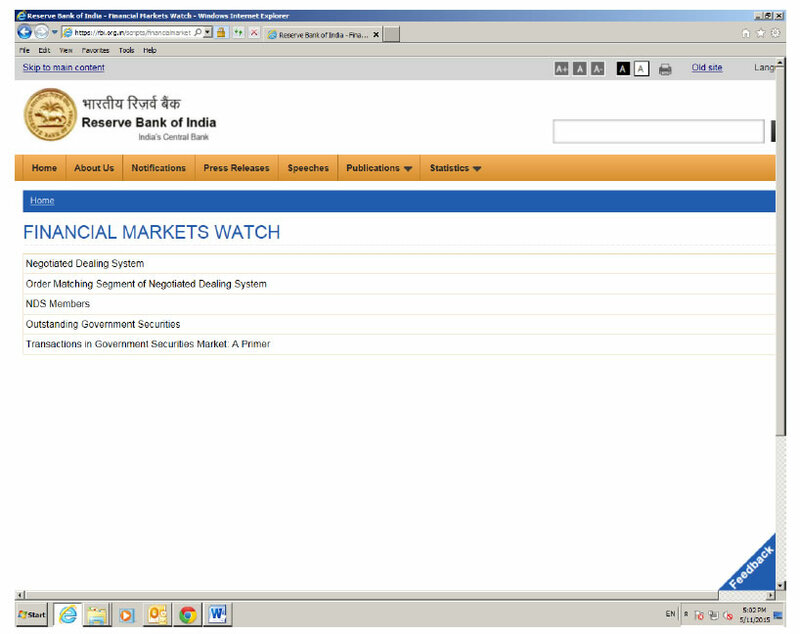 In August, 2005, RBI introduced an anonymous screen based order matching module called NDS-OM. This is an order driven electronic system, where the participants can trade anonymously by placing their orders on the system or accepting the orders already placed by other participants. Anonymity ensures a level playing field for various categories of participants. NDS-OM is operated by the CCIL on behalf of the RBI (Please see answer to the question no.19 about CCIL). Direct access to the NDS-OM system is currently available only to select financial institutions like Commercial Banks, Primary Dealers, well managed and financially sound UCBs and NBFCs, etc. Other participants can access this system through their custodians i.e. with whom they maintain Gilt Accounts. The custodians place the orders on behalf of their customers. The advantages of NDS-OM are price transparency and better price discovery. 8.2 Gilt Account holders have been given indirect access to the reporting module of NDS-OM through custodian institutions. 8.3 In this market, a participant, who wants to buy or sell a G-Sec, may contact a bank / PD/financial institution either directly or through a broker registered with SEBI and negotiate price and quantity of security. Such negotiations are usually done on telephone and a deal may be struck if both counterparties agree on the amount and rate. In the case of a buyer, like an UCB wishing to buy a security, the bank's dealer (who is authorized by the bank to undertake transactions in G-Secs) may get in touch with other market participants over telephone and obtain quotes. Should a deal be struck, the bank should record the details of the trade in a deal slip (specimen given at Annex 5). The dealer must exercise due diligence with regard to the price quoted by verifying with available sources (See question number 14 for information on ascertaining the price of G-Secs). All trades undertaken in OTC market are reported on the Reported segment of NDS-OM, the details of which are given under the question number 15. 8.4 RBI has launched NDS-OM-Web on June 29, 2012 for facilitating direct participation of gilt account holders (GAH) on NDS-OM through their primary members (PM) (as risk controller only and not having any role in pricing of trade). The GAH have access to the same order book of NDS-OM as the PM. GAH are in a better position to control their orders (place/modify/cancel/hold/release) and have access to real time live quotes in the market. Since notifications of orders executed as well as various queries are available online to the GAH, they are better placed to manage their positions. Web based interface that leverages on the gilt accounts already maintained with the custodian Banks/PDs provides an operationally efficient system to retail participants. Just like NDS-OM, RBI provides this facility also at no cost to its users. PMs, however, may recover the actual charges paid by them to CCIL for settlement of trades or any other charges like transaction cost, annual maintenance charges (AMC) etc. a. The Gilt Account Holder (GAH), say XYZ provident fund, approaches his custodian bank, (say ABC ), to convert his CSGL holdings (to the extent he wishes to trade, say ₹ 10,000), into Demat form. b. ABC reduces the GAH’s security balance by ₹ 10,000 and advises the depository of stock exchange (NSDL/CSDL) to increase XYZ’s Demat account by ₹ 10,000. ABC also advises to PDO, Mumbai to reduce its CSGL balance by ₹ 10,000 and increase the CSGL balance of NSDL/CSDL by ₹ 10,000.
c. NSDL/CSDL increases the Demat balance of XYZ by ₹ 10,000.
d. XYZ can now trade in G-Sec on stock exchange. 9. Who are the major players in the G-Secs market? Major players in the G-Secs market include commercial banks and PDs besides institutional investors like insurance companies. PDs play an important role as market makers in G-Secs market. A market maker provides firm two way quotes in the market i.e. both buy and sell executable quotes for the concerned securities. Other participants include co-operative banks, regional rural banks, mutual funds, provident and pension funds. Foreign Portfolio Investors (FPIs) are allowed to participate in the G-Secs market within the quantitative limits prescribed from time to time. Corporates also buy/ sell the G-Secs to manage their overall portfolio. 10. What are the Do's and Don’ts prescribed by RBI for the Co-operative banks dealing in G-Secs? While undertaking transactions in securities, UCBs should adhere to the instructions issued by the RBI. The guidelines on transactions in G-Secs by the UCBs have been codified in the master circular DCBR. BPD (PCB).MC.No. 4/16.20.000/2015-16 dated July 1, 2015 which is updated from time to time. This circular can also be accessed from the RBI website under the Notifications – Master circulars section (https://www.rbi.org.in/Scripts/BS_ViewMasCirculardetails.aspx?id=9849). The important guidelines to be kept in view by the UCBs relate to formulation of an investment policy duly approved by their Board of Directors, defining objectives of the policy, authorities and procedures to put through deals, dealings through brokers, preparing panel of brokers and review thereof at annual intervals, and adherence to the prudential ceilings fixed for transacting through each of the brokers, etc. The important Do’s & Don’ts are summarized in the Box I below. Segregate dealing and back-office functions. Officials deciding about purchase and sale transactions should be separate from those responsible for settlement and accounting. Monitor all transactions to see that delivery takes place on settlement day. The funds account and investment account should be reconciled on the same day before close of business. Keep a proper record of the SGL forms received/issued to facilitate counter-checking by their internal control systems/RBI inspectors/other auditors. Seek a Scheduled Commercial Bank (SCB), a PD or a Financial Institution (FI) as counterparty for transactions. Give preference for direct deals with counter parties. Insist on Delivery versus Payment for all transactions. 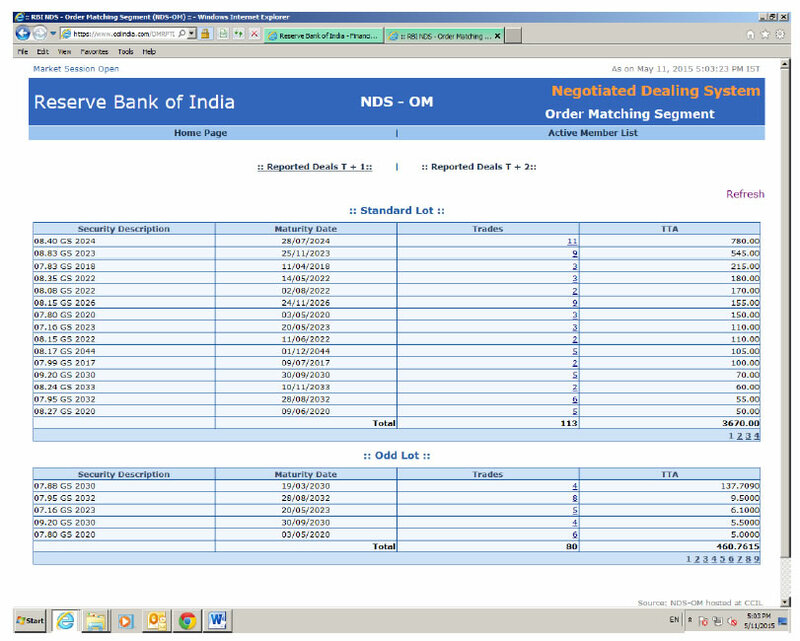 Take advantage of the NCB facility for acquiring G-Secs in the primary auctions conducted by the RBI. Restrict the role of the broker only to that of bringing the two parties to the deal together, if a deal is put through with the help of broker. Have a list of approved brokers. Utilize only brokers registered with NSE or BSE or OTCEI for acting as intermediary. Place a limit of 5% of total transactions (both purchases and sales) entered into by a bank during a year as the aggregate upper contract limit for each of the approved brokers. A disproportionate part of the business should not be transacted with or through one or a few brokers. Maintain and transact in G-Secs only in dematerialized form in SGL Account or Gilt Account maintained with the CSGL Account holder. Open and maintain only one Gilt or dematerialized account. Open a funds account for securities transactions with the same Scheduled Commercial bank or the State Cooperative bank with whom the Gilt Account is maintained. Ensure availability of clear funds in the designated funds accounts for purchases and sufficient securities in the Gilt Account for sales before putting through the transactions. Observe prudential limits for investment in permitted non-SLR securities (bonds of nationalized banks, unlisted securities, unlisted shares of all-India Financial Institutions and privately placed debt securities). Do not undertake any purchase/sale transactions with broking firms or other intermediaries on principal to principal basis. Do not use brokers in the settlement process at all, i.e., both funds settlement and delivery of securities should be done with the counter-parties directly. Do not give power of attorney or any other authorisation under any circumstances to brokers/intermediaries to deal on your behalf in the money and securities markets. Do not undertake G-Secs transaction in the physical form with any broker. Do not routinely make investments in non-SLR securities (e.g., corporate bonds, etc) issued by companies or bodies. 11. How are the dealing transactions recorded by the dealing desk? 11.1 For every transaction entered into by the trading desk, a deal slip should be generated which should contain data relating to nature of the deal, name of the counter-party, whether it is a direct deal or through a broker (if it is through a broker, name of the broker), details of security, amount, price, contract date and time and settlement date. The deal slips should be serially numbered and verified separately to ensure that each deal slip has been properly accounted for. Once the deal is concluded, the deal slip should be immediately passed on to the back office (it should be separate and distinct from the front office) for recording and processing. For each deal, there must be a system of issue of confirmation to the counter-party. The timely receipt of requisite written confirmation from the counter-party, which must include all essential details of the contract, should be monitored by the back office. The need for counterparty confirmation of deals matched on NDS-OM will not arise, as NDS-OM is an anonymous automated order matching system. In case of trades finalized in the OTC market and reported on NDS-OM reported segment, both the buying and selling counter parties report the trade particulars separately on the reporting platform which should match for the trade to be settled. 11.2 Once a deal has been concluded through a broker, there should not be any substitution of the counterparty by the broker. Similarly, the security sold / purchased in a deal should not be substituted by another security under any circumstances. 11.3 On the basis of vouchers passed by the back office (which should be done after verification of actual contract notes received from the broker / counter party and confirmation of the deal by the counter party), the books of account should be independently prepared. 12. What are the important considerations while undertaking security transactions? Which security to invest in – Typically this involves deciding on the maturity and coupon. Maturity is important because this determines the extent of risk an investor like an UCB is exposed to – higher the maturity, higher the interest rate risk or market risk. If the investment is largely to meet statutory requirements, it may be advisable to avoid taking undue market risk and buy securities with shorter maturity. Within the shorter maturity range (say 5-10 years), it would be safer to buy securities which are liquid, that is, securities which trade in relatively larger volumes in the market. 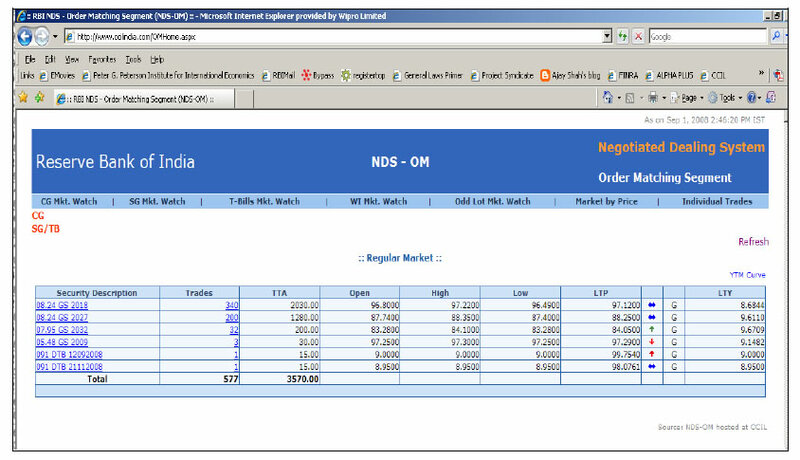 The information about such securities can be obtained from the website of the CCIL (http://www.ccilindia.com/OMMWCG.aspx), which gives real-time secondary market trade data on NDS-OM. Pricing is more transparent in liquid securities, thereby reducing the chances of being misled/misinformed. The coupon rate of the security is equally important for the investor as it affects the total return from the security. In order to determine which security to buy, the investor must look at the Yield to Maturity (YTM) of a security (please refer to Box III under para 24.4 for a detailed discussion on YTM). Thus, once the maturity and yield (YTM) is decided, the UCB may select a security by looking at the price/yield information of securities traded on NDS-OM or by negotiating with bank or PD or broker. Where and Whom to buy from- In terms of transparent pricing, the NDS-OM is the safest because it is a live and anonymous platform where the trades are disseminated as they are struck and where counterparties to the trades are not revealed. In case, the trades are conducted on the telephone market, it would be safe to trade directly with a bank or a PD. In case one uses a broker, care must be exercised to ensure that the broker is registered on NSE or BSE or OTC Exchange of India. Normally, the active debt market brokers may not be interested in deal sizes which are smaller than the market lot (usually ₹ 5 cr). 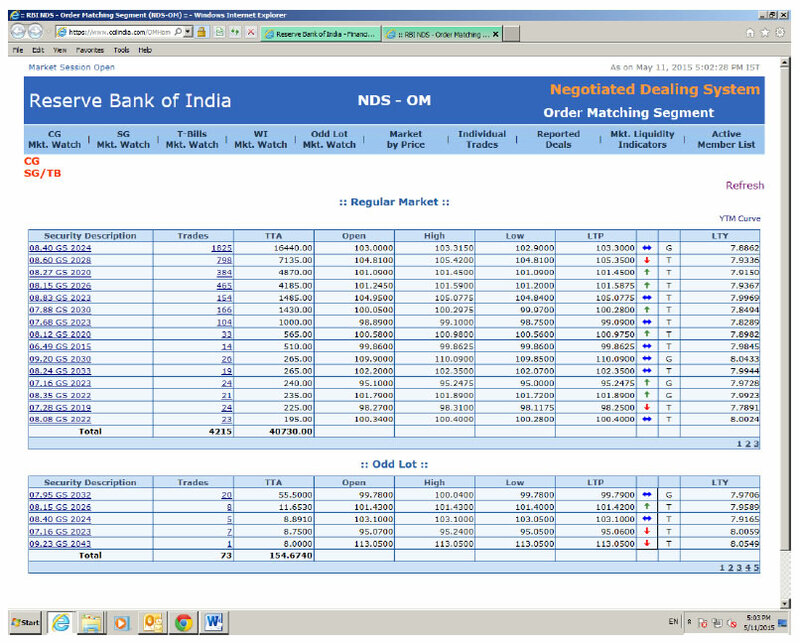 So it is better to deal directly with bank / PD or on NDS-OM, which also has a screen for odd-lots (i.e. less than ₹ 5 cr). Wherever a broker is used, the settlement should not happen through the broker. Trades should not be directly executed with any counterparties other than a bank, PD or a financial institution, to minimize the risk of getting adverse prices. How to ensure correct pricing – Since investors like UCBs have very small requirements, they may get a quote/price, which is worse than the price for standard market lots. To be sure of prices, only liquid securities may be chosen for purchase. A safer alternative for investors with small requirements is to buy under the primary auctions conducted by RBI through the non-competitive route. Since there are bond auctions almost every week, purchases can be considered to coincide with the auctions. Please see question 14 for details on ascertaining the prices of the G-Secs. 13. Why does the price of G-Sec change? The price of a G-Sec, like other financial instruments, keeps fluctuating in the secondary market. The price is determined by demand and supply of the securities. Specifically, the prices of G-Secs are influenced by the level and changes in interest rates in the economy and other macro-economic factors, such as, expected rate of inflation, liquidity in the market, etc. Developments in other markets like money, foreign exchange, credit and capital markets also affect the price of the G-Secs. Further, developments in international bond markets, specifically the US Treasuries affect prices of G-Secs in India. Policy actions by RBI (e.g., announcements regarding changes in policy interest rates like Repo Rate, Cash Reserve Ratio, Open Market Operations, etc.) also affect the prices of G-Secs. 14. How does one get information about the price of a G-Sec? 14.1 The return on a security is a combination of two elements (i) coupon income – that is, interest earned on the security and (ii) the gain / loss on the security due to price changes and reinvestment gains or losses. The website of the Fixed Income, Money Market and Derivatives Association (FIMMDA), (www.fimmda.org) is also a right source of price information, especially on securities that are not traded frequently. 15. How are the G-Secs transactions reported? 15.1 Transactions undertaken between market participants in the OTC / telephone market are expected to be reported on the NDS-OM platform within 15 minutes after the deal is put through over telephone. All OTC trades are required to be mandatorily reported on the NDS-OM reported segment for settlement. Reporting on NDS-OM is a two stage process wherein both the seller and buyer of the security have to report their leg of the trade. System validates all the parameters like reporting time, price, security etc. and when all the criterias of both the reporting parties match, the deals get matched and trade details are sent by NDS-OM system to CCIL for settlement. 15.2 Reporting on behalf of entities maintaining gilt accounts with the custodians is done by the respective custodians in the same manner as they do in case of their own trades i.e., proprietary trades. The securities leg of these trades settle in the CSGL account of the custodian. Funds leg settle in the current account of the PM with RBI. 15.3 In the case of NDS-OM, participants place orders (amount and price) in the desired security on the system. Participants can modify / cancel their orders. Order could be a ‘bid’ (for purchase) or ‘offer’ (for sale) or a two way quote (both buy and sell) of securities. The system, in turn, will match the orders based on price and time priority. That is, it matches bids and offers of the same prices with time priority. It may be noted that bid and offer of the same entity do not match i.e. only inter-entity orders are matched by NDS-OM and not intra-entity. The NDS-OM system has separate screen for trading of the Central Government papers, State Government securities (SDLs) and Treasury bills (including Cash Management Bills). In addition, there is a screen for odd lot trading also essentially for facilitating trading by small participants in smaller lots of less than ₹ 5 crore. The minimum amount that can be traded in odd lot is ₹ 10,000 in dated securities while it is ₹ 25,000 for T-Bills and CMBs. The NDS-OM platform is an anonymous platform wherein the participants will not know the counterparty to the trade. Once an order is matched, the deal ticket gets generated automatically and the trade details flow to the CCIL. Due to anonymity offered by the system, the pricing is not influenced by the participants’ size and standing. 16. How do the G-Sec transactions settle? 16.1 Once the allotment process in the primary auction is finalized, the successful participants are advised of the consideration amounts that they need to pay to the Government on settlement day. The settlement cycle for auctions of all kind of G-Secs i.e. dated securities, T-Bills, CMBs or SDLs, is T+1, i.e. funds and securities are settled on next working day from the conclusion of the trade. On the settlement date, the fund accounts of the participants are debited by their respective consideration amounts and their securities accounts (SGL accounts) are credited with the amount of securities allotted to them. 16.2 The transactions relating to G-Secs are settled through the member’s securities / current accounts maintained with the RBI. The securities and funds are settled on a net basis i.e. Delivery versus Payment System-III (DvP-III). CCIL guarantees settlement of trades on the settlement date by becoming a central counter-party (CCP) to every trade through the process of novation, i.e., it becomes seller to the buyer and buyer to the seller. 17. What is shut period? ‘Shut period’ means the period for which the securities can not be traded. During the period under shut, no trading of the security which is under shut is allowed. The main purpose of having a shut period is to facilitate finalizing of the payment of maturity redemption proceeds and to avoid any change in ownership of securities during this process. Currently, the shut period for the securities held in SGL accounts is one day. 18. What is Delivery versus Payment (DvP) Settlement? i. DvP I – The securities and funds legs of the transactions are settled on a gross basis, that is, the settlements occur transaction by transaction without netting the payables and receivables of the participant. ii. DvP II – In this method, the securities are settled on gross basis whereas the funds are settled on a net basis, that is, the funds payable and receivable of all transactions of a party are netted to arrive at the final payable or receivable position which is settled. iii. DvP III – In this method, both the securities and the funds legs are settled on a net basis and only the final net position of all transactions undertaken by a participant is settled. Liquidity requirement in a gross mode is higher than that of a net mode since the payables and receivables are set off against each other in the net mode. 19. What is the role of the Clearing Corporation of India Limited (CCIL)? The CCIL is the clearing agency for G-Secs. It acts as a Central Counter Party (CCP) for all transactions in G-Secs by interposing itself between two counterparties. In effect, during settlement, the CCP becomes the seller to the buyer and buyer to the seller of the actual transaction. All outright trades undertaken in the OTC market and on the NDS-OM platform are cleared through the CCIL. Once CCIL receives the trade information, it works out participant-wise net obligations on both the securities and the funds leg. The payable / receivable position of the constituents (gilt account holders) is reflected against their respective custodians. CCIL forwards the settlement file containing net position of participants to the RBI where settlement takes place by simultaneous transfer of funds and securities under the ‘Delivery versus Payment’ system. CCIL also guarantees settlement of all trades in G-Secs. That means, during the settlement process, if any participant fails to provide funds/ securities, CCIL will make the same available from its own means. For this purpose, CCIL collects margins from all participants and maintains ‘Settlement Guarantee Fund’. 20. What is the ‘When Issued’ market and “Short Sale”? 'When Issued', a short term of "when, as and if issued", indicates a conditional transaction in a security notified for issuance but not yet actually issued. All "WI " transactions are on an "if" basis, to be settled if and when the security is actually issued. 'WI transactions in the Central G-Secs have been permitted to all NDS-OM members and have to be undertaken only on the NDS-OM platform. WI market helps in price discovery of the securities being auctioned as well as better distribution of the auction stock. For urban cooperative banks, detailed guidelines have been issued in the RBI master circular DCBR.BPD. (PCB).MC.No 4/16.20.000/2015-16 dated July 01, 2015. Short Sale is defined as sale of securities one does not own. Scheduled Commercial Banks and Primary Dealers are permitted to undertake short sale of Central Government dated securities in NDS-OM as well as OTC market, subject to limits and other terms and conditions prescribed by the RBI from time to time. Certain Urban Cooperative Banks specifically permitted by the Department of Cooperative Bank Supervision for the purpose, can also undertake intra-day short sale of Government securities subject to adherence to the short sale limits, reporting and other risk management requirements prescribed for eligible entities by RBI from time to time. Further a custodian is allowed to undertake a short sale transaction with its GAH within the permissible short sale limits and a custodian is allowed to put through a cover transaction with a GAH to square a short sale transaction in the related security undertaken with a market participant other than its GAH/s. 21. What are the basic mathematical concepts one should know for calculations involved in bond prices and yields? The time value of money functions related to calculation of Present Value (PV), Future Value (FV), etc. are important mathematical concepts related to bond market. An outline of the same with illustrations is provided in Box II below. Money has time value as a Rupee today is more valuable and useful than a Rupee a year later. The concept of time value of money is based on the premise that an investor prefers to receive a payment of a fixed amount of money today, rather than an equal amount in the future, all else being equal. In particular, if one receives the payment today, one can then earn interest on the money until that specified future date. Further, in an inflationary environment, a Rupee today will have greater purchasing power than after a year. The present value formula is the core formula for the time value of money. Year Amount discount factor P.V. Net present value (NPV) or net present worth (NPW) is defined as the present value of net cash flows. It is a standard method for using the time value of money to appraise long-term projects. Used for capital budgeting, and widely throughout economics, it measures the excess or shortfall of cash flows, in present value (PV) terms, once financing charges are met. Ct - the net cash flow (the amount of cash) at time t (for educational purposes, C0 is commonly placed to the left of the sum to emphasize its role as the initial investment.). 22. How is the Price of a bond calculated? What is the total consideration amount of a trade and what is accrued interest? The price of a bond is nothing but the sum of present value of all future cash flows of the bond. The interest rate used for discounting the cash flows is the Yield to Maturity (YTM) (explained in detail in question no. 24) of the bond. Price can be calculated using the excel function ‘Price’ (please refer to Annex 6,). Accrued interest is the interest calculated for the broken period from the last coupon day till a day prior to the settlement date of the trade. Since the seller of the security is holding the security for the period up to the day prior to the settlement date of the trade, he is entitled to receive the coupon for the period held. During settlement of the trade, the buyer of security will pay the accrued interest in addition to the agreed price and pays the ‘consideration amount’. Here the price quoted is called ‘clean price’ as the ‘accrued interest’ component is not added to it. The last coupon date being Nov 25, 2013, the number of days in broken period till Jan 29, 2014 (one day prior to settlement date i.e. on trade day) are 65. 23. What is the relationship between yield and price of a bond? When the market price of the bond is less than the face value, i.e., the bond sells at a discount, YTM > > coupon yield. When the market price of the bond is more than its face value, i.e., the bond sells at a premium, coupon yield > > YTM. When the market price of the bond is equal to its face value, i.e., the bond sells at par, YTM = = coupon yield. 24. How is the yield of a bond calculated? Income from reinvestment of the interest payments that is interest-on-interest. 24.2 The coupon yield is simply the coupon payment as a percentage of the face value. Coupon yield refers to nominal interest payable on a fixed income security like G-Sec. This is the fixed return the Government (i.e., the issuer) commits to pay to the investor. Coupon yield thus does not reflect the impact of interest rate movement and inflation on the nominal interest that the Government pays. 24.3 The current yield is simply the coupon payment as a percentage of the bond’s purchase price; in other words, it is the return a holder of the bond gets against its purchase price which may be more or less than the face value or the par value. The current yield does not take into account the reinvestment of the interest income received periodically. The current yield considers only the coupon interest and ignores other sources of return that will affect an investor’s return. 24.4 Yield to Maturity (YTM) is the expected rate of return on a bond if it is held until its maturity. The price of a bond is simply the sum of the present values of all its remaining cash flows. Present value is calculated by discounting each cash flow at a rate; this rate is the YTM. Thus YTM is the discount rate which equates the present value of the future cash flows from a bond to its current market price. In other words, it is the internal rate of return on the bond. The calculation of YTM involves a trial-and-error procedure. A calculator or software can be used to obtain a bond’s YTM easily (please see the Box III). YTM could be calculated manually as well as using functions in any standard spread sheet like MS Excel. Manual or trial and error method is complicated because G-Secs have many cash flows running into future. This is explained by taking an example below. Take a two year security bearing a coupon of 8% and a price of say ₹ 102 per face value of ₹ 100; the YTM could be calculated by solving for ‘r’ below. Typically it involves trial and error by taking a value for ‘r’ and solving the equation and if the right hand side is more than 102, take a higher value of ‘r’ and solve again. Linear interpolation technique may also be used to find out exact ‘r’ once we have two ‘r’ values so that the price value is more than 102 for one and less than 102 for the other value. In the MS Excel programme, the following function could be used for calculating the yield of periodically coupon paying securities, given the price. Settlement is the security's settlement date. The security settlement date is the date on which the security and funds are exchanged. Maturity is the security's maturity date. The maturity date is the date when the security expires. Rate is the security's annual coupon rate. Price is the security's price per ₹100 face value. Redemption is the security's redemption value per ₹100 face value. 25. What are the day count conventions used in calculating bond yields? Day count convention refers to the method used for arriving at the holding period (number of days) of a bond to calculate the accrued interest. As the use of different day count conventions can result in different accrued interest amounts, it is appropriate that all the participants in the market follow a uniform day count convention. For example, the conventions followed in Indian market are given below. Bond market: The day count convention followed is 30/360, which means that irrespective of the actual number of days in a month, the number of days in a month is taken as 30 and the number of days in a year is taken as 360. Money market: The day count convention followed is actual/365, which means that the actual number of days in a month is taken for number of days (numerator) whereas the number of days in a year is taken as 365 days. Hence, in the case of T-Bills, which are essentially money market instruments, money market convention is followed. In some countries, participants use actual/actual, some countries use actual/360 while some use 30/actual. Hence the convention changes in different countries and in different markets within the same country (eg. 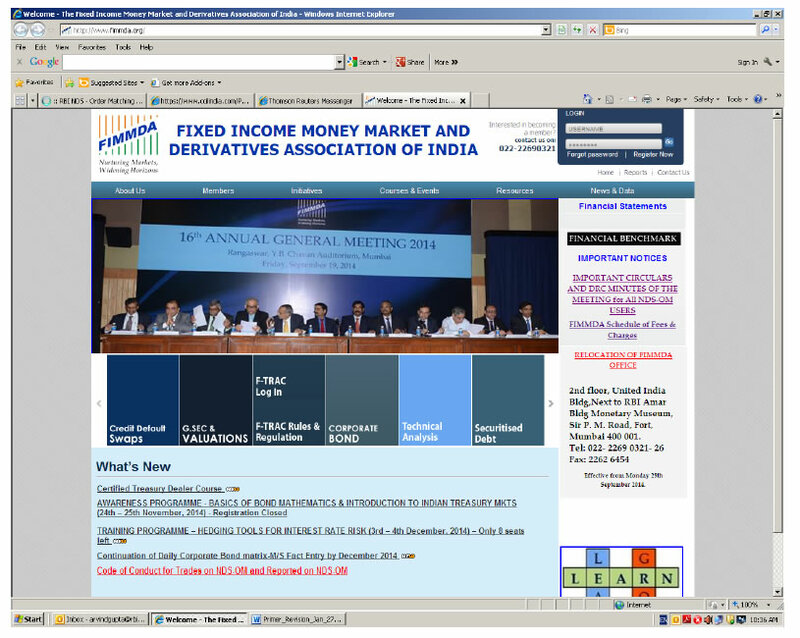 Money market convention is different than the bond market convention in India). 26. 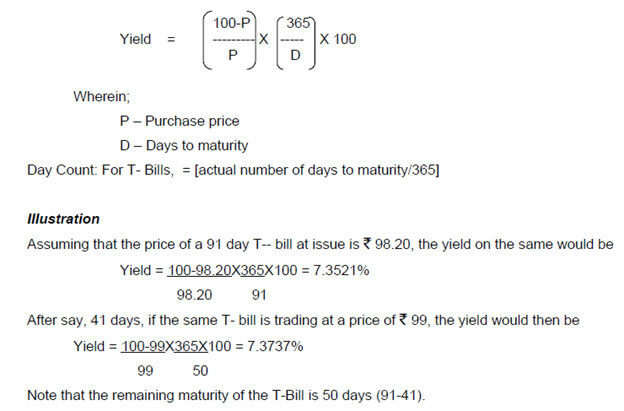 How is the yield of a T- Bill calculated? 27.1 Duration (also known as Macaulay Duration) of a bond is a measure of the time taken to recover the initial investment in present value terms. In simplest form, duration refers to the payback period of a bond to break even, i.e., the time taken for a bond to repay its own purchase price. Duration is expressed in number of years. A step by step approach for working out duration is given in the Box IV below. First, each of the future cash flows is discounted to its respective present value for each period. Since the coupons are paid out every six months, a single period is equal to six months and a bond with two years maturity will have four time periods. Second, the present values of future cash flows are multiplied with their respective time periods (these are the weights). That is the PV of the first coupon is multiplied by 1, PV of second coupon by 2 and so on. Third, the above weighted PVs of all cash flows is added and the sum is divided by the current price (total of the PVs in step 1) of the bond. The resultant value is the duration in no. of periods. Since one period equals to six months, to get the duration in no. of year, divide it by two. This is the time period within which the bond is expected to pay back its own value if held till maturity. The weighted average term (time from now to payment) of a bond's cash flows or of any series of linked cash flows. The higher the coupon rate of a bond, the shorter the duration (if the term of the bond is kept constant). Duration is always less than or equal to the overall life (to maturity) of the bond. Only a zero coupon bond (a bond with no coupons) will have duration equal to its maturity. The sensitivity of a bond's price to interest rate (i.e., yield) movements. Duration is useful primarily as a measure of the sensitivity of a bond's market price to interest rate (i.e., yield) movements. It is approximately equal to the percentage change in price for a given change in yield. For example, for small interest rate changes, the duration is the approximate percentage by which the value of the bond will fall for a 1% per annum increase in market interest rate. So a 15-year bond with a duration of 7 years would fall approximately 7% in value if the interest rate increased by 1% per annum. In other words, duration is the elasticity of the bond's price with respect to interest rates. 27.3 PV01 describes the actual change in price of a bond if the yield changes by one basis point (equal to one hundredth of a percentage point). It is the present value impact of 1 basis point (0.01%) (1%=100 bps) movement in interest rate. It is often used as a price alternative to duration (a time measure). Higher the PV01, the higher would be the volatility (sensitivity of price to change in yield). From the modified duration (given in the illustration under 27.2), we know that the security value will change by 1.78% for a change of 100 basis point (1%) change in the yield. In value terms that is equal to 1.78*(102/100) = ₹ 1.81. Hence the PV01 = 1.81/100 = ₹ 0.018, which is 1.8 paise. Thus, if the yield of a bond with a Modified Duration of 1.78 years moves from say 9% to 9.05% (5 basis points), the price of the bond moves from ₹102 to ₹101.91 (reduction of 9 paise, i.e., 5x1.8 paise). 27.4 Calculation of change in price for change in yields based on duration works only for small changes in prices. This is because the relationship between bond price and yield is not strictly linear i.e., the unit change in price of the bond is not proportionate to unit change in yield. Over large variations in prices, the relationship is curvilinear i.e., the change in bond price is either less than or more than proportionate to the change in yields. This is measured by a concept called convexity, which is the change in duration of a bond per unit change in the yield of the bond. 28. What are the important guidelines for valuation of securities? 28.1 For Cooperative banks, investments classified under 'Held to Maturity' (HTM) category need not be marked to market and will be carried at acquisition cost unless it is more than the face value, in which case the premium should be amortized over the period remaining to maturity. The individual scrip in the ‘Available for Sale’ (AFS) category in the books of the cooperative banks will be marked to market at the year-end or at more frequent intervals. The individual scrip in the ‘Held for Trading’ (HFT) category will be marked to market at monthly or at more frequent intervals. The book value of individual securities in AFS and HFT categories would not undergo any change after marking to market. 28.3 State Government and other securities are to be valued by applying YTM method by marking it up by a spread on the Central G-Sec yield of the corresponding residual maturity. Currently, a spread of 25 basis points (0.25%) is added while valuing State G-Secs, special securities (oil bonds, fertilizer bonds, SBI bonds, etc.) whereas for corporate bonds the spreads given by the FIMMDA need to be added. An illustration of valuation taking a State Government bond is given in the Box V below. Find the residual maturity of the bond to be valued. Find the Central G-Sec yield for the above residual maturity. Calculate the price of the security using the derived yield above. Since valuation is being done on Jan 27, 2014, we need to find out the number of years from this date to the maturity date of the security i.e. Jan 1, 2024 to get the residual maturity of the security. This could be done manually by counting the number of years and months and days. However, an easier method will be to use MS. Excel function ‘Yearfrac’ wherein we specify the two dates and basis (please refer to Annex 6 on Excel functions for details). This gives us the residual maturity of 9.93 years for the security. To find the Central Government yield for 9.93 years, we derive it by interpolating the yields between 9.75 years and 10 years, which are given out by FIMMDA. As on Jan 27, 2014, FIMMDA yields for 9.75 and 10 years are 8.83% and 8.84% respectively. The yield for the 9.93 years is derived by using the following formula. Having found the Central Government yield for the particular residual maturity, we have to now load the appropriate spread to get the yield of the security to be valued. Since the security is State G-Sec, the applicable spread is 25 basis points (0.25%). Hence the yield would be 8.84%+0.25% = 9.09%. Note: FIMMDA yields are now available from 3 months to upto 30 years with 3 month interval i.e. yield is available for 3 month, 6 month, 9 month, 1 yr, 1.25 yr and so on upto 30 year security. The price of the security can now be calculated using the MS Excel function ‘Price’ (Please see the details in Annex 6). Here, we specify the valuation date as Jan 27, 2014, maturity date as Jan 1, 2024, rate as 9.40% which is the coupon, yield as 9.09%, redemption as 100 which is the face value, frequency of coupon payment as 2 and basis as ‘4’ (Pl. see example 3 in Annex 6). The price we get in the formula is ₹101.9843 which is the value of the security. If the bank is holding ₹10 crore of this security in its portfolio, the total value would be 10*(101.9843/100) 10.19843 crore. 28.4 In the case of corporate bonds, the procedure of valuation is similar to the illustration given in Box V above. The only difference is the spread that need to be added to the corresponding yield on central G-Sec will be higher (instead of the fixed 25 bps for State G-Secs), as published by the FIMMDA from time to time. FIMMDA gives out the information on corporate bond spreads for various ratings of bonds. While valuing a bond, the appropriate spread has to be added to the corresponding CG yield and the bond has to be valued using the standard ‘Price’ formula. For example, assuming that a ‘AAA’ rated corporate bond is having same maturity as that of the State Government bond in Box V, the applicable yield for valuation will be 8.83%+ 2.09% (being the spread given by FIMMDA) which is 10.92%. With the same parameters as in Box V, the value of the bond works out to ₹ 90.9121. 29. What are the risks involved in holding G-Secs? What are the techniques for mitigating such risks? 29.1 Market risk – Market risk arises out of adverse movement of prices of the securities due to changes in interest rates. This will result in booking losses on marking to market or realizing a loss if the securities are sold at adverse prices. Small investors, to some extent, can mitigate market risk by holding the bonds till maturity so that they can realize the yield at which the securities were actually bought. 29.2 Reinvestment risk – Cash flows on a G-Sec includes fixed coupon every half year and repayment of principal at maturity. These cash flows need to be reinvested whenever they are paid. Hence there is a risk that the investor may not be able to reinvest these proceeds at profitable rates due to changes in interest rate scenario prevailing at the time of receipt of cash flows by investors. 29.3 Liquidity risk – Liquidity in G-Secs is referred to as the ease with which security can be bought and sold i.e. availability of buy-sell quotes with narrow spread say 1-2 paise. Liquidity risk refers to the inability of an investor to liquidate (sell) his holdings due to non-availability of buyers for the security, i.e., no trading activity in that particular security or circumstances resulting in distressed sale (selling at a much lower price than its holding cost) causing loss to the seller. Usually, when a liquid bond of fixed maturity is bought, its tenor gets reduced due to time decay. For example, a 10 year security will become 8 year security after 2 years due to which it may become illiquid. The bonds also become illiquid when there are no frequent reissuances by the issuer (RBI) in those bonds. Bonds are generally reissued till a sizeable amount becomes outstanding under that bond. However, issuer and sovereign has to ensure that there is no excess burden on Government at the time of maturity of the bond as very large amount maturing on a single day may affect the fiscal position of Government. Hence, generally reissuances under any security are stopped after outstanding under that bond touches a particular limit. Due to illiquidity, the investor may need to sell at adverse prices in case of urgent funds requirement. However, in such cases, eligible investors can participate in market repo and borrow the money against the collateral of such securities. 29.4 Holding securities till maturity could be a strategy through which one could avoid market risk. Rebalancing the portfolio wherein the securities are sold once they become short term and new securities of longer tenor are bought could be followed to manage the portfolio risk. However, rebalancing involves transaction and other costs and hence needs to be used judiciously. Market risk and reinvestment risk could also be managed through Asset Liability Management (ALM) by matching the cash flows with liabilities. ALM could also be undertaken by matching the duration of the cash flows. Advanced risk management techniques involve use of derivatives like Interest Rate Swaps (IRS) through which the nature of cash flows could be altered. However, these are complex instruments requiring advanced level of expertise for proper understanding. Adequate caution, therefore, need to be observed for undertaking the derivatives transactions and such transactions should be undertaken only after having complete understanding of the associated risks and complexities. 30. What is Money Market? i. Overnight market - The tenor of transactions is one working day. ii. Notice money market – The tenor of the transactions is from 2 days to 14 days. iii. Term money market – The tenor of the transactions is from 15 days to one year. What are the different money market instruments? 30.2 Money market instruments include call money, repos, T- Bills, Commercial Paper, Certificate of Deposit and Collateralized Borrowing and Lending Obligations (CBLO). 30.3 Call money market is a market for uncollateralized lending and borrowing of funds. This market is predominantly overnight and is open for participation only to scheduled commercial banks and the primary dealers. 30.4 Repo or ready forward contact is an instrument for borrowing funds by selling securities with an agreement to repurchase the said securities on a mutually agreed future date at an agreed price which includes interest for the funds borrowed. 30.5 The reverse of the repo transaction is called ‘reverse repo’ which is lending of funds against buying of securities with an agreement to resell the said securities on a mutually agreed future date at an agreed price which includes interest for the funds lent. 30.6 It can be seen from the definition above that there are two legs to the same transaction in a repo/ reverse repo. The duration between the two legs is called the ‘repo period’. Predominantly, repos are undertaken on overnight basis, i.e., for one day period. Settlement of repo transactions happens along with the outright trades in G-Secs. 30.7 The consideration amount in the first leg of the repo transactions is the amount borrowed by the seller of the security. On this, interest at the agreed ‘repo rate’ is calculated and paid along with the consideration amount of the second leg of the transaction when the borrower buys back the security. The overall effect of the repo transaction would be borrowing of funds backed by the collateral of G-Secs. 30.8 The repo market is regulated by the Reserve Bank of India. All the above mentioned repo market transactions should be traded/reported on the electronic platform called the Clearcorp Repo Order Matching System (CROMS). 30.9 As part of the measures to develop the corporate debt market, RBI has permitted select entities (scheduled commercial banks excluding RRBs and LABs, PDs, all-India FIs, NBFCs, mutual funds, housing finance companies, insurance companies) to undertake repo in corporate debt securities. This is similar to repo in G-Secs except that corporate debt securities are used as collateral for borrowing funds. Only listed corporate debt securities that are rated ‘AA’ or above by the rating agencies are eligible to be used for repo. Commercial paper, certificate of deposit, non-convertible debentures of original maturity less than one year are not eligible for this purpose. These transactions take place in the OTC market and are required to be reported on FIMMDA platform within 15 minutes of the trade for dissemination of trade information. They are also to be reported on the clearing house of any of the exchanges for the purpose of clearing and settlement. 30.10 CBLO is another money market instrument operated by the Clearing Corporation of India Ltd. (CCIL), for the benefit of the entities who have either no access to the inter-bank call money market or have restricted access in terms of ceiling on call borrowing and lending transactions. CBLO is a discounted instrument available in electronic book entry form for the maturity period ranging from one day to ninety days (up to one year as per RBI guidelines). In order to enable the market participants to borrow and lend funds, CCIL provides the Dealing System through Indian Financial Network (INFINET), a closed user group to the Members of the RBI CBS E-Kuber, who maintain Current account with RBI and through Internet for other entities who do not maintain Current account with RBI. 30.11 Membership to the CBLO segment is extended to entities who are RBI- NDS members, viz., Nationalized Banks, Private Banks, Foreign Banks, Co-operative Banks, Financial Institutions, Insurance Companies, Mutual Funds, Primary Dealers, etc. Associate Membership to CBLO segment is extended to entities who are not members of RBI- CBS E-Kuber, viz., Co-operative Banks, Mutual Funds, Insurance companies, NBFCs, Corporates, Provident/ Pension Funds, etc. 30.12 By participating in the CBLO market, CCIL members can borrow or lend funds against the collateral of eligible securities. Eligible securities are Central G-Secs including Treasury Bills, and such other securities as specified by CCIL from time to time. Borrowers in CBLO have to deposit the required amount of eligible securities with the CCIL based on which CCIL fixes the borrowing limits. CCIL matches the borrowing and lending orders submitted by the members and notifies them. While the securities held as collateral are in custody of the CCIL, the beneficial interest of the lender on the securities is recognized through proper documentation. 30.13 Commercial Paper (CP) is an unsecured money market instrument issued in the form of a promissory note. Corporates, primary dealers (PDs) and the all-India financial institutions (FIs) that have been permitted to raise short-term resources under the umbrella limit fixed by the Reserve Bank of India are eligible to issue CP. CP can be issued for maturities between a minimum of 7 days and a maximum up to one year from the date of issue. 30.14 Certificate of Deposit (CD) is a negotiable money market instrument and issued in dematerialised form or as a Usance Promissory Note, for funds deposited at a bank or other eligible financial institution for a specified time period. Banks can issue CDs for maturities from 7 days to one year whereas eligible FIs can issue for maturities from 1 year to 3 years. 31. What are the role and functions of FIMMDA? 31.1 The Fixed Income Money Market and Derivatives Association of India (FIMMDA), an association of Scheduled Commercial Banks, Public Financial Institutions, Primary Dealers and Insurance Companies was incorporated as a Company under section 25 of the Companies Act,1956 on June 3, 1998. FIMMDA is a voluntary market body for the bond, money and derivatives markets. FIMMDA has members representing all major institutional segments of the market. The membership includes Nationalized Banks such as State Bank of India, its associate banks and other nationalized banks; Private sector banks such as ICICI Bank, HDFC Bank; Foreign Banks such as Bank of America, Citibank, Financial institutions such as IDFC, EXIM Bank, NABARD, Insurance Companies like Life Insurance Corporation of India (LIC), ICICI Prudential Life Insurance Company, Birla Sun Life Insurance Company and all Primary Dealers. 31.2 FIMMDA represents market participants and aids the development of the bond, money and derivatives markets. It acts as an interface with the regulators on various issues that impact the functioning of these markets. It also undertakes developmental activities, such as, introduction of benchmark rates and new derivatives instruments, etc. FIMMDA releases rates of various G-Secs that are used by market participants for valuation purposes. FIMMDA also plays a constructive role in the evolution of best market practices by its members so that the market as a whole operates transparently as well as efficiently. 32. What are the various websites that give information on G-Secs? This site provides links to information on prices of G-Secs on NDS-OM, money market and other information on G-Secs like outstanding stock etc. This site provides real-time information on traded as well as quoted prices of G-Secs, both in Order matching and Reporting segment. In addition, prices of When Issued (WI) (whenever trading takes place) segment are also provided. This site provides information on prices of G-Secs in OTC market. One can see chronological traded price levels and quantity in various securities. This site provides a host of information on market practices for all the fixed income securities including G-Secs. Details of various pricing models adopted by FIMMDA are provided in this site. In addition, the details of daily, monthly and yearly closing prices of G-Secs, corporate bond spreads etc. are made available by FIMMDA through this site. Accessing information from this site requires a valid login and password which are provided by FIMMDA to the eligible entities. Phone:(022) 30031100 , 66202261 /2200 HDFC Bank Ltd.
* Bank PDs are those which take up PD business departmentally as part of the bank itself. ** Stand alone PDs are Non Banking Financial Companies (NBFCs) that exclusively take up PD business. The accrued interest on a bond is the amount of interest accumulated on a bond since the last coupon payment. The interest has been earned, but because coupons are paid only on coupon dates, the investor has not gained the money yet. In India day count convention for G-Secs is 30/360. The price/yield being offered by a potential buyer for a security. When the price is quoted as ₹102.35, the portion other than decimals (102) is called the big figure. Competitive bid refers to the bid for the stock at the price stated by a bidder in an auction. The rate of interest paid on a debt security as calculated on the basis of the security’s face value. Coupon payments are made at regular intervals throughout the life of a debt security and may be quarterly, semi-annual (twice a year) or annual payments. When the price of a security is below the par value, it is said to be trading at a discount. The value of the discount is the difference between the FV and the Price. For example, if a security is trading at ₹ 99, the discount is ₹ 1. Duration of a bond is the number of years taken to recover the initial investment of a bond. It is calculated as the weighted average number of years to receive the cash flow wherein the present value of respective cash flows are multiplied with the time to that respective cash flows. The total of such values is divided by the price of the security to arrive at the duration. Refer to Box IV under question 27. Face value is the amount that is to be paid to an investor at the maturity date of the security. Debt securities can be issued at varying face values, however in India they typically have a face value of ₹100. The face value is also known as the repayment amount. This amount is also referred as redemption value, principal value (or simply principal), maturity value or par value. Bonds whose coupon rate is re-set at predefined intervals and is based on a pre-specified market based interest rate. G-Secs are also known as gilts or gilt edged securities. “G-Sec” means a security created and issued by the Government for the purpose of raising a public loan or for any other purpose as may be notified by the Government in the Official Gazette and having one of the forms mentioned in the G-Secs Act, 2006. Market lot refers to the standard value of the trades that happen in the market. The standard market lot size in the G-Secs market is ₹ 5 crore in face value terms. The date when the principal (face value) is paid back. The final coupon and the face value of a debt security is repaid to the investor on the maturity date. The time to maturity can vary from short term (1 year) to long term (30 years). NCB means the bidder would be able to participate in the auctions of dated G-Secs without having to quote the yield or price in the bid. The allotment to the non-competitive segment will be at the weighted average rate that will emerge in the auction on the basis of competitive bidding. It is an allocating facility wherein a part of total securities are allocated to bidders at a weighted average price of successful competitive bid. (Please also see paragraph no.4.3 under question no.4). Transactions of any value other than the standard market lot size of ₹ 5 crore are referred to as odd lot. Generally the value is less than the ₹ 5 crore with a minimum of ₹10,000/-. Odd lot transactions are generally done by the retail and small participants in the market. Par value is nothing but the face value of the security which is ₹ 100 for G-Secs. When the price of a security is equal to face value, the security is said to be trading at par. When the price of a security is above the par value, the security is said to be trading at premium. The value of the premium is the difference between the price and the face value. For example, if a security is trading at ₹102, the premium is ₹ 2. The price quoted is for per ₹ 100 of face value. The price of any financial instrument is equal to the present value of all the future cash flows. The price one pays for a debt security is based on a number of factors. Newly-issued debt securities usually sell at, or close to, their face value. In the secondary market, where already-issued debt securities are bought and sold between investors, the price one pays for a bond is based on a host of variables, including market interest rates, accrued interest, supply and demand, credit quality, maturity date, state of issuance, market events and the size of the transaction. In order to accomplish the objective of meeting the Government borrowing needs as cheaply and efficiently as possible, a group of highly qualified financial firms/ banks are appointed to play the role of specialist intermediaries in the G-Sec market between the issuer on the one hand and the market on the other. Such entities are generally called Primary dealers or market makers. In return of a set of obligations, such as making continuous bids and offer price in the marketable G-Secs or submitting reasonable bids in the auctions, these firms receive a set of privileges in the primary/ secondary market. RTGS system is a funds transfer mechanism for transfer of money from one bank to another on a “real time” and on “gross” basis. This is the fastest possible money transfer system through the banking channel. Settlement in “real time” means payment transaction is not subjected to any waiting period. The transactions are settled as soon as they are processed. “Gross settlement” means the transaction is settled on one to one basis without bunching with any other transaction. Considering that money transfer takes place in the books of the Reserve Bank of India, the payment is taken as final and irrevocable. Repo rate is the return earned on a repo transaction expressed as an annual interest rate. Repo means an instrument for borrowing funds by selling securities of the Central Government or a State Government or of such securities of a local authority as may be specified in this behalf by the Central Government or foreign securities, with an agreement to repurchase the said securities on a mutually agreed future date at an agreed price which includes interest for the fund borrowed. Reverse Repo means an instrument for lending funds by purchasing securities of the Central Government or a State Government or of such securities of a local authority as may be specified in this behalf by the Central Government or foreign securities, with an agreement to resell the said securities on a mutually agreed future date at an agreed price which includes interest for the fund lent. The remaining period until maturity date of a security is its residual maturity. For example, a security issued for an original term to maturity of 10 years, after 2 years, will have a residual maturity of 8 years. The market in which outstanding securities are traded. This market is different from the primary or initial market when securities are sold for the first time. Secondary market refers to the buying and selling that goes on after the initial public sale of the security. Under Tap sale, a certain amount of securities is created and made available for sale, generally with a minimum price, and is sold to the market as bids are made. These securities may be sold over a period of day or even weeks; and authorities may retain the flexibility to increase the (minimum) price if demand proves to be strong or to cut it if demand weakens. Tap and continuous sale are very similar, except that with Tap sale the debt manager tends to take a more pro-active role in determining the availability and indicative price for tap sales. Continuous sale are essentially at the initiative of the market. Debt obligations of the Government that have maturities of one year or less are normally called Treasury Bills or T-Bills. Treasury Bills are short-term obligations of the Treasury/ Government. They are instruments issued at a discount to the face value and form an integral part of the money market. The arrangement by which investment bankers undertake to acquire any unsubscribed portion of a primary issuance of a security. It is the weighted average mean of the price/ yield where weight being the amount used at that price/ yield. The allotment to the non-competitive segment will be at the weighted average price/yield that will emerge in the auction on the basis of competitive bidding. The annual percentage rate of return earned on a security. Yield is a function of a security’s purchase price and coupon interest rate. Yield fluctuates according to numerous factors including global markets and the economy. Yield to maturity is the total return one would expect to receive if the security is being held until maturity. Yield to maturity is essentially the discount rate at which the present value of future payments (investment income and return of principal) equals the price of the security. The graphical relationship between yield and maturity among bonds of different maturities and the same credit quality. This curve shows the term structure of interest rates. It also enables investors to compare debt securities with different maturities and coupons.